Secretary of Newbiggin Traders Association Enid Wilson. A refurbished church will host a wedding fair in the county this weekend. Following the recent re-opening of St Marks Church in Newbiggin, the community venue will host a wedding fair to showcase everything from vintage bridal gowns and cars to modern table favours and decorations. 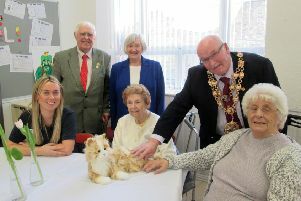 Enid Wilson, secretary of the Newbiggin Traders Association, said: “It’s important to have the chance to explore ideas when planning your big day so we thought it would be a great idea to hold this event. The fair runs from 10am to 4pm on Saturday, September 20. Admission is £2 per person and the first 100 visitors will receive a goody bag.